Electronics, movies, video games and music, home and furniture, home improvement, clothing, footwear, jewelry, shoes, toys, health and beauty, pet supplies, sporting goods and fitness, auto, photofinishing, craft supplies, party supplies, grocery, fresh foods, electricity products. Originally consisting of discount stores, Walmart Canada's contemporaries include Giant Tiger, Home Hardware, Canadian Tire and Dollarama. Based on the success of the US format, Walmart Canada has focused on expanding Supercentres from new or converted locations, offering groceries which puts them in the same market as supermarket chains such as Loblaws, Real Canadian Superstore, Metro, Sobeys, Thrifty Foods, Safeway, Save-On-Foods, Country Grocer, Fairway Markets, Quality Foods, Co-op and others. Walmart is the second largest retailer in Canada by revenue $. Walmart Canada held grand openings of 15 supercentres in January 2016, completing its expansion plan for the company's fiscal year, ending January 31, 2016. As of January 31, 2019, Walmart Canada's total count is 411 stores, including 339 supercentres and 72 discount stores in every province and territory except for Nunavut. Walmart Canada's principal developer and landlord is SmartCentres; other significant landlords include Riocan and First Capital Realty. Walmart Canada was established in 1994 through the acquisition by Walmart of 122 Canadian leases of Woolco, a troubled subsidiary of Woolworth Canada. The same year, these Woolco stores were renovated and converted into the Walmart banner. Wal-Mart did not acquire 22 other Woolco stores that were either unionized or had downtown locations. Some former Woolco stores were sold and re-opened as Zellers stores. All 16,000 former employees of the Woolco stores that Walmart acquired were retained, retrained, and given a five percent raise. Mario Pilozzi, a senior vice-president at Woolco when the deal was signed, eventually became CEO of Walmart Canada. Pilozzi, who retired in 2008, has proclaimed that he and "his management team took a limping chain and turned it into the Walmart powerhouse that became a game-changer on the Canadian business scene. Retailers changed, Canadian manufactures faced demands and volumes they had not seen before, real estate transitioned from enclosed malls to big-box plazas". Reflecting on the 1994 deal in 2013, a Walmart Canada spokesman was quoted as saying "Even though Woolco had seen better days and was struggling, there was still an enormous amount of talent in that company. I think that is one of the reasons Walmart has succeeded in Canada, is because we started with a fantastic team that we re-motivated". Since 1994, many of the shopping centres in which Walmart is located have been developed by SmartCentres (originally known as First Pro), a real estate company founded by Mitchell Goldhar. At present, Smartcentres is the landlord for approximately 100 Walmarts in Canada. Beginning in the fall of 2006, Walmart opened new Supercentres in Canadian cities. Walmart Canada also operated Sam's Club stores in Ontario from 2003 to 2009. On February 26, 2009, they announced that it would close all six of its Canadian Sam's Club locations. This was part of Walmart Canada's decision to shift focus towards Supercenter stores, but some industry observers suggested that the operation was struggling to compete with Costco and the non-membership Real Canadian Superstore (known as Maxi & Cie in Quebec). Sam's Club also rebranded two unopened locations as new Walmart Supercentres. From originally taking over much of the Woolco chain, Walmart Canada has expanded and opened new stores. It grew to 260 stores by 2005, making it Canada's second-largest retail chain. A Supercentre in Vaughan, ON in January 2008. In 2011, Walmart Canada acquired the leases of 39 Zellers stores from Target, originally one of the 189 leaseholds purchased from Hudson's Bay Company and slated for conversion to Target Canada stores. Walmart Canada managed to convert and reopen some of the former Zellers stores before Target Canada's launch. Unlike Walmart's 1994 move into Canada, Walmart Canada this time did not guarantee the jobs of the employees whose stores it was acquiring. 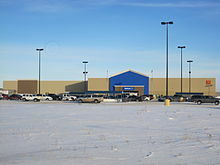 Walmart Canada launched the "Urban 90" format in 2012, a set of smaller Supercentres averaging 90,000 sq ft (8,400 m2). On May 8, 2015, following the bankruptcy of Target Canada, Walmart Canada announced its intent to acquire thirteen former Target locations, along with its distribution centre in Cornwall, Ontario subject to court approval. These locations include an unopened location at the Bayshore Shopping Centre in Ottawa. Walmart in Fort Saskatchewan, AB, with the old design in August 2016. This has since been renovated. However, ones in Vegreville and Okotoks retain this design. With the success of both Walmart in Canada and Walmart Supercenters in the United States, it was announced in late 2005 that the Supercentre concept would be arriving in Canada. On November 8, 2006, Canada's first three Supercentres opened in Ancaster, London, and Stouffville in Ontario. Alberta became the second province with Supercentres in September 2007. The first Supercentre in Vancouver, British Columbia opened in January 2009 in a former Costco/Price Club location, which moved to a new larger site nearby in Burnaby. Walmart Supercentres range from 67,000 to 340,000 sq ft (6,200 to 31,600 m2). Walmart Supercentres stock everything a Walmart Discount Store does, but also include a full-service supermarket, including meat and poultry, baked goods, delicatessen, frozen foods, dairy products, garden produce, and fresh seafood. Many Walmart Supercenters also feature a garden centre, pet shop, Axess Law office, pharmacy, Tire & Lube Express, optical centre, one-hour photo processing lab, portrait studio, a clinic and numerous alcove shops, such as cellular phone stores, hair and nail salons, video rental stores (including Redbox rental kiosks), local bank branches, and fast food outlets, Walmart Canada Bank launched its application for banking licence in 2008 to compete with similar stores in Canada such as Loblaw. On July 24, 2009, Walmart Canada Bank was incorporated under the Bank Act in Canada. Walmart Discount Stores are discount department stores varying in size from 51,000 to 150,000 sq ft (4,738.1 to 13,935.5 m2), with the average store covering about 102,000 sq ft (9,476.1 m2). They carry general merchandise and a selection of dried goods. Many of these stores also have a garden centre, pharmacy, Axess Law office, Tire & Lube Express, optical centre, one-hour photo processing lab, portrait studio, bank branch, cell phone store and fast food outlet, usually McDonald's (although stores that are in former Zellers locations typically do not contain a McDonald's). Walmart Discount Stores carry limited grocery items, which are limited mostly to dried goods. Most stores were converted into Supercentres in the late 2000s. Walmart Canada operated Sam's Club warehouse clubs in Ontario from 2006 to 2009. On February 26, 2009, they announced that it would close all six of its Canadian Sam's Club locations. Sam's Club also rebranded two unopened locations as new Walmart Supercentres. This was part of Walmart Canada's decision to shift focus towards supercenter stores. 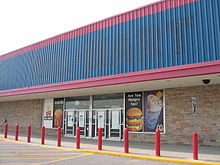 Some industry observers suggested that the Canadian Sam's Club never enjoyed the success of its American counterpart due to competition with Costco and the non-membership the Real Canadian Superstore (known as Maxi & Ci] in Quebec), as both chains that had a well-established history in Canada while Sam's Club was a late entrant. That same year, Walmart Canada confirmed that it was in discussions with home improvement chain Lowe's to take over five of the six Sam's Club locations. Raised and donated over $100 million since 1994 to Children's Miracle Network (CMN) to support children's hospitals across Canada. Contributed $2.9 million to more than 1,000 local non-profit organizations through Walmart's Local Matching Grant program. Raised and contributed $2.8 million for the Breakfast for Learning Canada program, a school nutrition program and partnership with a goal to ensure all school children attend class well nourished and ready to learn. Became the top corporate sponsor of the Canadian Red Cross, with $1 million in relief aid related to Hurricane Katrina, the India earthquake and other projects. Donated $300,000 to Evergreen, a Canadian non-profit environmental organization to help community groups create and improve green space in urban areas across the country. Awarded $115,000 in scholarships to Canadian university and college students. Supported 150 Canadian schools through a number of programs including Walmart Canada's Adopt-a School program. Walmart Canada has been criticized for using low prices to drive out rivals and local businesses. Within ten years of Walmart's entry into Canada, well-established retailer chains such as Zellers, The Bay, and Sears Canada have struggled, with Kmart Canada being sold to Zellers while Eaton's (whom Walmart Canada overtook to become Canada's largest retailer) filed for bankruptcy. The continued difficulties of competing against Walmart Canada eventually led to HBC selling the leases of most Zellers stores to Target Canada, who also went out of business. In June 2005, Vancouver City Council voted 8–3 to reject Wal-Mart's proposal to build its first store in the city, a 143,000 sq ft (13,300 m2) store on Southeast Marine Drive. All eight Coalition of Progressive Electors (COPE) councillors against the project, while Mayor Larry Campbell and Non-Partisan Association (NPA) councillors, Sam Sullivan and Peter Ladner, were in favor. Wal-Mart's proposed store was designed by local architect Peter Busby for sustainable development, with windmills generating power and underground wells heating and cooling the building which would consume 1/3 the energy of a normal store, and it was endorsed by city planners and staffers. Councillor Anne Roberts stated that her opposition was due to potential traffic and congestion that the store would bring to south Vancouver, although she later remarked "I'm not a fan of Wal-Mart, and I've always been concerned about their labour practices, about getting goods from sweatshops". Like its American parent, Walmart Canada has been the subject of criticism that it has engaged in practices that discourage associates from exercising their right to join a union and negotiate a collective bargaining agreement. Walmart Canada has been accused of undermining internet rights and freedom of speech, as a result of its June 2009 decision to seek an injunction against the Walmart Workers Canada campaign and its longstanding Walmart Workers Canada website in particular, a labour rights website sponsored by United Food and Commercial Workers Union Canada (UFCW Canada). In Saskatchewan, Walmart fought unionization drivers at stores in Weyburn and North Battleford. The company's tactics eventually resulted in the Labour Relations Board imposing a fine and ordering them to hand over relevant documents, including the anti-union handbook for managers. A Walmart store in Windsor, was unionized in 1997, but workers dissolved the union three years later after it failed to sign contract with management. Entrance of Walmart (formerly Zellers from late 1970s–2012) through the mall of Centre Domaine in Montreal, QC, in October 2012. The United Food and Commercial Workers Union (UFCW), which had long been unsuccessful in unionizing Walmarts in the United States and much of Canada, was able to take advantage of Quebec's union-friendly laws to make some progress. These laws permit card check organizing, which gives unions more power than secret ballot organizing used in the rest of Canada, and mandates arbitration if the two sides fail to reach a contract. The UFCW argued that union card-signing was more democratic than secret votes because "when there is a vote Walmart uses intimidation tactics". In addition, Quebec's labour relations board had ordered Walmart Canada to stop "intimidating and harassing" cashiers at a store in Sainte-Foy, near Quebec City in the midst of an organizing drive. Walmart has responded, mostly by shutting down unionized stores or stalling labour contract negotiations. For instance they closed their Saguenay, Quebec store, in April 2005 after workers unionized and just days before contract settlement by binding arbitration, putting 190 employees out of work. Walmart argued that the store wasn't profitable and the Supreme Court of Canada affirmed 6-3 on November 27, 2009 that the company had the legal right to close the store. Walmart also closed its automotive centre in Gatineau, Quebec, after employees unionized and an arbitrator imposed a 33% wage increase. Exterior of abandoned Kingston, ON Walmart store in June 2005. There was the successful unionization by the UFCW of a Walmart store in Jonquière, Quebec in August 2004, as told in the documentary Wal-Mart: The High Cost of Low Price. The initial card check organizing efforts fell one vote short, and in April 2004 a secret ballot to join the union was defeated 53% to 47%. However, when a group of managers gathered just outside the front door to celebrate for the TV cameras and taunt union supporters as they left the store, this spectacle offended many of the workers that originally voted against the union and caused them to switch sides, leading to a second and successful card check that unionized the store in August 2004. However, nine days of negotiation between the UFCW and Wal-Mart were fruitless, with the union accusing the company of not negotiating in good faith while Walmart argued that the union wanted the store to hire an additional 30 workers. Walmart closed the store five months later because the company did not approve of the new "business plan" a union would require, and this move was permitted by Quebec law as long as the closure was permanent. This labour dispute between Walmart and the UFCW made headlines worldwide; three of the other forty-six Walmarts in the province of Quebec were temporarily closed by bomb threats, while a TV broadcaster likened Wal-Mart to Nazi Germany, and Saguenay mayor Jean Tremblay denounced the company as a "freebooting scofflaw". Walmart CEO H. Lee Scott Jr. argued that the Jonquière store was struggling, while polls in Canada showed that 9 of 10 Canadians believed that the store closure was mainly due to the unionization. A local newspaper columnist accused the UFCW leaders in Washington, D.C. of using the Jonquière store workers (in a city with chronically high unemployment, and whose stores had been wiped out by the opening of the Place du Royaume shopping mall in Chicoutimi) as "cannon fodder" to provoke a fight in order to incite public opinion against the Walmart, knowing that Walmart headquarters would not tolerate a unionized store. In September 2005, the Quebec Labour Board ruled that the closing of a Walmart store amounted to a reprisal against unionized workers and has ordered additional hearings on possible compensation for the employees, though it offered no details. Union organizers suggested that Walmart was making an example of the Jonquière store to pressure workers at other locations not to unionize. At the Saint-Hyacinthe, Quebec Walmart, the 200 employees had organized successfully in January 2005 but contract negotiations stalled and an arbitrator was called in, finally reaching a two-year deal on April 9, 2009. However the Saint-Hyacinthe contract was seen largely as a Pyrrhic victory for the UFCW, as the arbitrator portrayed "Walmart as at least as good an employer-even a superior employer- compared with other retailers", noting that Walmart workers were paid more than their counterparts at Zellers. The union's calls for wage and benefit increases were all rejected, particularly their demand for an automatic-progression annual wage scales, as that would have conflicted with the company-wide annual performance evaluation, a key component of Walmart's business model. The arbitrator awarded existing workers (but not new hires) a small wage gain of 30¢ an hour to prevent them from being "impoverished" by dues paid to a union that failed to justify wages increases to the arbitrator. In 2011, the Saint-Hyacinthe Walmart employees voted (147 out of 250) to decertify United Food and Commercial Workers as their representative union; it has been suggested that employees were disappointed in their union whose 2009 contract was tilted strongly in favour of their employer. Walmart employees in Gatineau, Quebec joined the United Food and Commercial Workers Union (UFCW) in 2008. This was followed by two years of stalled negotiations before an arbitrator imposed a collective agreement. In November 2011, after one year with their first collective agreement, the 150 Wal-Mart employees voted to decertify. 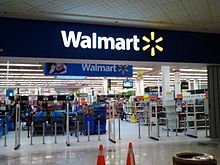 On August 15, 2013, the Supreme Court of Canada cleared the way for Walmart employees in Weyburn, Saskatchewan who voted 51–5 to decertify United Food and Commercial Workers as their representative union. This left no unionized Wal-Mart stores in the whole of Canada. On July 14, 2015 Walmart Canada disabled their online photo site, blaming a third party vendor, believed to be PNI Digital Media. Walmart's shutdown was followed shortly after by other companies suspending their photo site whilst an investigation took place. In common with other potential victims there was no confirmation or denial about whether hackers had stolen customer photographs as well as data and payment information. Walmart offers photo services through their online website as of 2017. ^ "Walmart celebrates 20 years in Canada". CTV.ca. March 17, 2014. Archived from the original on October 23, 2016. Retrieved March 17, 2014. ^ a b "Information for Walmart Investors: Unit Counts & Square Footage". Retrieved February 19, 2019. ^ a b "Once ignored, REIT now a major player". The Globe and Mail. 2004-12-07. Retrieved 2018-01-18. ^ a b "Walmart Canada signs deal with Target Canada for 39 Zellers locations". June 24, 2011. Archived from the original on August 30, 2011. ^ "Plus grande offensive de Wal-Mart au Canada en 13 ans". May 10, 2007. Archived from the original on September 19, 2016. ^ a b c Bianco, Anthony (February 13, 2006). "No Union Please, We're Wal-Mart". Bloomberg Businessweek. Archived from the original on March 10, 2016. ^ "Listen Today to Build Tomorrow". Archived from the original on October 22, 2016. Retrieved March 30, 2013. ^ a b "Zellers employees walk away empty-handed in $1.825-billion deal Zellers employees walk away empty-handed in $1.825-billion deal". Archived from the original on August 24, 2014. ^ "SmartREIT Annual Report 2016" (PDF). ^ "Walmart Canada bets big on supercenters". January 26, 2011. Archived from the original on October 18, 2016. ^ a b "Wal-Mart Canada closing all 6 Sam's Club locations". February 26, 2009. Archived from the original on May 13, 2011. ^ a b Georgiades, Andy (February 26, 2009). "Walmart Canada to Close Sam's Club Division". The Wall Street Journal. ^ a b "Walmart Canada to close six Ontario Sam's Club locations to focus on supercenter expansion" (Press release). Walmart Canada. February 26, 2009. Archived from the original on January 15, 2016. ^ a b Flavelle, Dana (February 26, 2009). "Walmart to close all Canadian Sam's Club stores". Toronto Star. Archived from the original on April 24, 2016. Retrieved February 26, 2009. ^ The Canadian Press (June 24, 2011). "Walmart picks up 39 Zellers sites from Target". CBC.ca. Archived from the original on January 15, 2016. Retrieved June 24, 2011. ^ Kopun, Francine. "Walmart beats Target to the punch in Canada". The Star. Toronto. Archived from the original on March 4, 2016. ^ Russell, Pete. "Walmart goes small with "Urban 90" Supercentre". Canadian Grocer. Archived from the original on April 3, 2016. ^ "Walmart to buy 13 former Target Canada stores and a distribution centre". Canadian Press. Archived from the original on February 2, 2017. Retrieved May 8, 2015. ^ "Walmart launches 1-hour grocery delivery in GTA with Instacart partnership". CTV News. 13 September 2018. Retrieved 14 September 2018. ^ "Wal-Mart unveils plans to open up to 14 supercentres in 2010". Canadian Broadcasting Corporation. Archived from the original on November 14, 2012. ^ "Walmart shifts to Supercenters in Alberta". Archived from the original on November 29, 2014. ^ "Wal-Mart finally finds a home in Vancouver". Archived from the original on January 15, 2016. ^ "Wal-Mart files for Canadian banking licence". Archived from the original on November 1, 2010. ^ "Canada Gazette – Government Notices". Archived from the original on December 20, 2010. ^ "Walmart Canada Market Fact Sheet" (PDF). Archived (PDF) from the original on May 6, 2017. ^ "Walmart Canada and Evergreen Continue Green Grants Partnership". Archived from the original on May 11, 2006. ^ a b c d e Krauss, Clifford (March 10, 2005). "For Labor, a Wal-Mart Store Closing in Canada Is a Call to Arms". The New York Times. Archived from the original on May 6, 2017. ^ "No Wal-Mart for Vancouver". CBC News. Archived from the original on March 10, 2016. ^ "Vancouver and Wal-Mart – a missed opportunity". Archived from the original on April 27, 2016. Retrieved March 1, 2013. ^ "Walmart Workers Canada". Archived from the original on February 15, 2012. ^ "Wake Up Wal-Mart". Archived from the original on November 29, 2014. Retrieved March 30, 2013. ^ a b "Wal-Mart wins big union battle". Archived from the original on October 29, 2013. Retrieved March 30, 2013. ^ "Wal-Mart allowed to close unionized Saguenay store: SCOC". Archived from the original on February 27, 2012. ^ "Walmart faces Canadian labour clash". MSNBC. April 30, 2006. Archived from the original on August 10, 2007. Retrieved July 26, 2006. ^ Austen, Ian (September 20, 2005). "Quebec panel rejects Walmart store closing". International Herald Tribune. Archived from the original on February 26, 2008. Retrieved March 2, 2007. ^ "Unionized Quebec Walmart workers get 1st contract – Ottawa – CBC News". Archived from the original on May 5, 2009. ^ a b "Wal-Mart workers in Weyburn, Sask., vote to dump union". CBC News. August 16, 2013. Archived from the original on January 16, 2017. ^ "Wal-Mart workers hope to show their union the door". The Star. Toronto. Archived from the original on January 15, 2016. ^ "Quebec Wal-Mart bargaining unit is decertified". Archived from the original on March 4, 2016. Retrieved October 10, 2012. ^ Clarke, Katrina (July 14, 2015). "Wal-Mart Canada shuts online photo centre over potential credit card data breach". Archived from the original on March 11, 2016. ^ "Costco joins Walmart in shutting online photo store after possible data breach". July 21, 2015. Archived from the original on April 30, 2016. ^ Pagliery, Jose (July 17, 2015). "CVS Photo website might have been hacked". Archived from the original on March 28, 2017. ^ "Walmart Photo Centre". Archived from the original on October 6, 2016. Retrieved March 10, 2016. 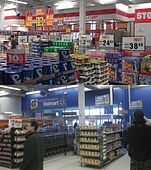 Wikimedia Commons has media related to Walmart stores in Canada.